Celebrate July 4th with a delicious red, white and blue menu! Recipes serve four. Preheat the oven or grill to 400°F. Lay chicken breasts in an oiled baking pan. Make 6 deep slits across the top of each chicken breast, being careful not to cut all the way through. Season each with salt, pepper and pesto. Slice the tomatoes and mozzarella, and cut each into half-moons. 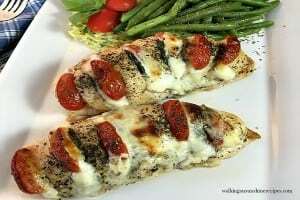 Stuff a piece of mozzarella and a tomato slice into every slit in the chicken. Sprinkle breadcrumbs evenly over top. Drizzle with olive oil and balsamic vinegar and bake for 20-25 minutes until cooked through (160°F on meat thermometer). If using a grill or skillet, set to medium and cover while heating to ensure chicken cooks through. Cook potatoes in salted water until tender, then peel and dice. 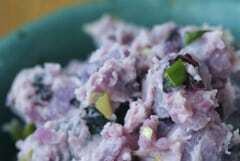 Combine onion, sour cream, oil, and lemon juice in a small bowl; pour over potatoes and mix. Add salt and pepper to taste and sprinkle with chives. 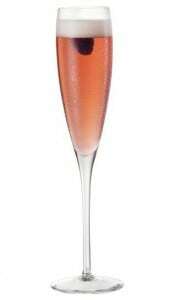 Pour Chambord into 4 flutes or wine glasses and top with champagne. Garnish each with some berries and a lemon twist. Pour graham cracker crumbs into a medium bowl; stir in sugar. Add butter, and mix until well-combined. Press the crumb mixture into the bottom of a rectangular 9×11 pan. Chill crust at least 30 minutes. For filling, place softened cream cheese in a large bowl and stir until smooth. Add condensed milk, lemon juice and vanilla. Pour filling evenly over chilled crust and smooth the top. Cover with plastic wrap and refrigerate until firm (2 1/2 to 3 hours). Once chilled, create the berry flag. For the stars, place 6-7 blueberries in a line across the upper left corner of cake. Continue to lay down blueberries in rows until the square is filled and resembles the stars on a U.S. flag. 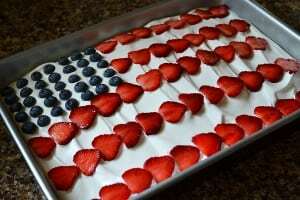 For the stripes, arrange strawberry slices in horizontal rows around the blueberries to match the stripes on a U.S. flag. Cover with the plastic wrap and chill until ready to serve.